Every game counts in fantasy football. The majority of the money and the league championships are won during the final stretch of the season though and there’s nothing like having a player or two on your team take off just at the right time. Here is a look at five players who finished hot a year ago and played a hand in winning some owners league titles a year ago. Can they pick up where they left off? There are plenty of reasons to suggest they will keep being fantasy producers in the season ahead and prove to be worth a mid-round selection on draft day. When the Patriots leaned on Lewis last year he delivered, scoring nine times in the 11 contests he started and leading the league in rushing yards during the second half. He was huge down the stretch. From Weeks 13 through 17, only three backs scored more than his 99.5 PPR points. During that span he tallied 100 touches for 525 total yards and five touchdowns. The veteran led all qualified runners with a 97 percent catch rate (caught 32 of 33 targets) and a 73.2 elusive rating in 2017. He was also the only player with 200 or more rushing attempts last season not to have a fumble. The Titans went after him hard in free agency and Lewis seems to be a nice fit for new offensive coordinator Matt LaFleur’s system. He complements Derrick Henry well and should help give Tennessee a nice 1-2 punch. Lewis should benefit from defenses also having to focus on Marcus Mariota as a potential rushing threat. The hype is building on Garoppolo and the 49ers’ offense as a whole. Following a trade deadline deal, the former Patriot backup started the final five games of 2017 and he was QB7 during that span with 87 fantasy points as he led his new team to five straight wins, including the last three coming versus playoff teams. If you project his production over 16 games he would’ve netted 278.4 fantasy points, which would’ve placed him 10th among quarterbacks for the season. Kyle Shanahan helps fuel the production with his aggressive play-calling. Each of his past three offenses has ranked inside top eight in passing yards. Shanahan’s offenses are known to sputter in the red zone though, and Garoppolo showed that by only throwing six TD passes in five starts. His price is too high right now in fantasy given the immense depth at the position to return value, but his future looks bright. 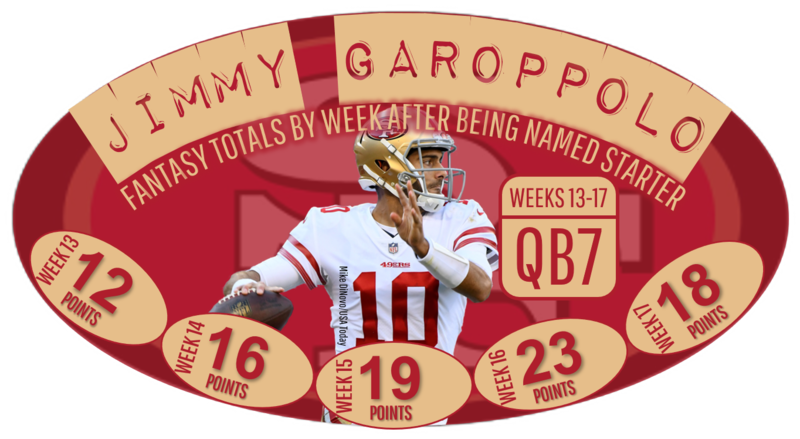 With Garoppolo under center there will be many San Francisco players who will prove to be fantasy assets this season. During the three games Zach Ertz was injured last year (including two missed games) for Philadelphia, Burton delivered by catching 11 balls for 154 yards and 3 touchdowns. Over the pivotal stretch of Weeks 13 through 15 only Travis Kelce and Rob Gronkowski scored more fantasy points at the position. Burton parlayed that success into the Bears making him the sixth-highest-paid tight end in football. The 26-year-old doesn’t boast a big frame (6-3, 235), but is an extraordinary athlete having played quarterback, running back and wide receiver during his time as a Florida Gator. Matt Nagy loved leaning on Kelce during his time under Andy Reid in Kansas City and he’ll look to make Burton a focal point in his new offense. There is some risk with his small sample size and the fact that the Bears have another capable young tight end in Adam Shaheen, who is going to compete for snaps. Still, Burton should be considered a back-end TE1 across all formats with a tremendous amount of upside heading into 2018. Crowder posted WR1 numbers as he pulled in 24 of his 33 targets for 344 yards and three touchdowns from Weeks 12 to 16, finishing fifth among all qualified wide receivers during that span in non-PPR points per snap (0.28) and points per opportunity (0.38). His value is a bit limited by his lack of big-play ability and his tendency not to find the end zone very frequently. He posted a dismal 7.9-yard average depth of target in 2017 and he only has scored 12 times over the past three years. Since 2015 he’s only caught nine (3 TD catches) of the 22 passes thrown his way inside the 10-yard line. In an offseason where there has been an immense amount of changes in the Washington offense, Crowder offers a level of familiarity. He has 67 and 66 receptions out of the slot over the past two seasons. He should prove to be a nice safety net for new quarterback Alex Smith. The Redskin offers WR3 value in PPR setups. Injuries led to Williams being the lead back over the final eight games and he averaged 93.3 yards per contest over that span. If you project that out over a full season it would be over 1,500 total yards. During Weeks 12-14 he tallied 376 total yards and scored five times. Williams isn’t a flashy player, but he is efficient. He excelled in his pass-blocking, rating second at the position among running backs with a 95.5 pass-block efficiency mark and he was the only running back in the league to lose yards on four percent or less of his carries. With Aaron Jones and Ty Montgomery still in the mix, it remains to be seen how the workload will be spread out when all running backs are healthy, but Jones is suspended for the first two games and that should help Williams begin the year as the starter. For now, Williams appears to be the best bet to be the early-down back in the Packers’ high-powered offense and is going for a very nice price.